Your plumbing includes all of the pipes and fixtures on your property, from the meter or valve near the street to the faucets inside your home. This value is normally located where the water line enters your home through the foundation. It can be used to shut the water off in an emergency or when plumbing improvements are being made. It can also be turned off while the property is vacant to prevent water damage that unforeseen leaks might cause. To make sure this valve works properly, turn it off and verify that the water flow to your fixtures has stopped completely. When the valve is turned back on, it should be opened fully to allow unrestricted water flow. The pressure reducing valve (PRV), which is normally located near the main water valve. PRV’s are usually bell-shaped devices, approximately 4″ in length, which are designed to keep the water pressure inside your home from exceeding a set limit. This helps prevent “knocking” in pipes and other stresses caused by high pressure. Hot water heaters do just as their name suggests, provide a source of hot water for your home appliances requiring hot water. Hot water heaters manufactured between the years of 1993 and 1996 have the possibility of containing a defective dip tube. The dip tubes break down inside the heater and cause plastic white chips to flow to the water faucets. The white chips do not pose a health risk but can cause a decrease in water flow to faucets. To test whether the chips are from the dib tube, apply some heat to them. If they smoke and smell like plastic then they are from the dip tube. Another way to check is by placing the chips in a cup of water. Chips that float are from the dip tube. To fix the problem, you must replace the dip tube. Also, the hot water heater will have to be flushed to ensure that all white chips are out of the piping. Leaky sinks can be a major source of water waste, and cost you money. According to the EPA, easily corrected household water leaks frequently rob consumers of eight percent of their water bill. The trick to fixing a leaky faucet is to know what kind you have. There are several different types of faucets including a compression faucet, a ceramic disk faucet, a ball-type faucet and a cartridge faucet. The compression faucets are usually of the two-handled variety. The ball-type and cartridge faucets are the single lever faucets commonly found in the kitchen. Faucet leaks are usually caused by worn-out seals. 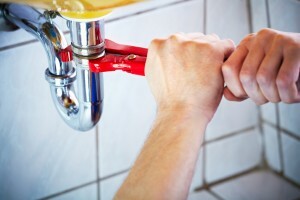 Since each type of faucet requires different materials to fix the leak, it is best to consult your local hardware store for the most accurate information or parts you’ll need to fix it. Add a few drops of food coloring or use a packet of powdered kool aid to the tank behind the bowl. Wait 10 minutes without flushing. If the color appears in the bowl, the flapper is likely defective or leaking. Water and Sewer Service Laterals are the pipes that run underground from the meter or valve near the street to the main water valve inside the house. They are typically made of copper, plastic, or sections of both and are your property and responsibility. Always contact Miss Utility prior to digging anywhere in your yard. You can do this by ensuring nothing goes down the drain or flushed into the toilet that shouldn’t be. Items like cooking oil and pan grease should never be poured down the drain, nor should caustic liquid items, such as oven cleaner, or harder items like meat scraps, plastics or metals. Discharge of surface or ground water to the sanitary sewer system is strictly prohibited. Under County Code, violators are subject to termination of service and fines. If you have a sump pump dewatering fountain or area drain, insure it discharges to surface drainage. Frozen water pipes are a serious risk during very cold winter weather. When water freezes in a pipe it expands and can exert pressure over 2,000 pounds per square inch. This pressure is enough to rupture most any pipe filled with water which provides no place for the ice to expand. When the pipe bursts it will spill several hundred gallons of water per hour, and that equates to thousands of dollars of damage to your home. If there is no water throughout your household, please contact your water department or if you are on a well you may need to have your well pump checked. Close the inside values and drains the pipes leading to your outside hose bib (faucet). Know where your main shut off valve is and label it. Minimize the potential for water damage by ensuring that everyone in the household knows how to shut off the water in case of an emergency. Insulate pipes in unheated and uninsulated spaces such as in a crawlspace, attic, outside walls, etc. ; make sure to insulate them with foam insulation at a minimum. Ideally you should wrap them with electrical heating tape first, and then insulate them. During cold weather to prevent your pipes from freezing, allow a faucet to drip cold water slowly. The faucet you choose should be the furthest from the main water shut off valve. Allow warm air to circulate around pipes by opening cabinet doors under the kitchen and bathroom sinks. If you have small children, please remove and replace all toxic cleaners out of their reach.